Machines Model HDM are horizontal type universal hard bearing balancing machines provided with Microprocessor based measuring panel HDM-8500 for balancing different shapes of rotors like rotors of Electronic machines, crankshafts, cylinders, gas compressors, flywheels, turbine rotors, rotors of centrifugal pumps and any other type of rotors of rotating machines. 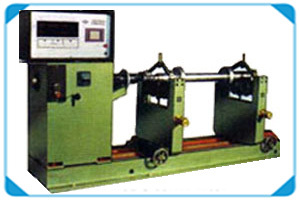 Dynamic Balancing Machine features a very simple operation. The working cycle is fully automatic. From safety point of view a double press push button starts machine, measures and stores, the unbalance values on DPMs for two planes simultaneously and stop machine ( with brake if machine is provided with Electronic breaking facility.) The measuring cycle general is less than 10 seconds for normal rotors which can be accelerated within 5 seconds.